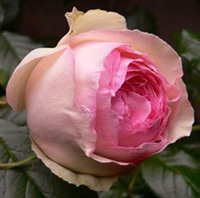 The rose Wedgewood was first bred in the United Kingdom by David Austin in 2009. For those few of you who may have never heard of him, David Austin is a famous British breeder who specializes in shrub roses and climbing roses old and new. He is considered a world renowned expert in breeding roses and has more than 40 years under his belt, mastering his craft. The parentage of Wedgewood is not currently known. Wedgewood roses will grow to heights of anywhere from 6 feet tall, all the way up to 10 feet tall if properly pruned and trained. The blooms on this rose are a stunning pink rose color with a lighter blush on the reverse of the petals. The blooms on the rose Wedgewood will average about 3.5” in diameter and they will be extremely full, having as many as 40 or more petals each. This particular rose is often sought after for cut flower arrangements because its blooms have a modest fruity or clove scented fragrance. Wedgewood is a very vigorous grower and it can be trained as either a climber or a shrub rose. 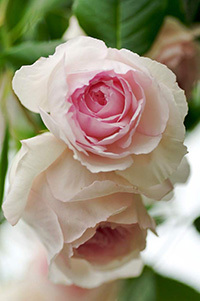 Growing the rose Wedgewood is not difficult however you will need to take care to give it a proper location for growing. For starters, this variety is a repeat bloomer, which means it will need adequate sun light if you want it to give you its best performance. A good rule of thumb is to find a spot in your garden that receives at least 6 to 8 hours each day of direct sun light. If you have a spot in mind that receives more, then all the better! Wedgewood roses should also be grown in soil that drains well, but does not rob the plant of the vital nutrients that it needs to survive. This can really be said about all types of roses and there are ways you can amend your soil to give your rose Wedgewood the best chance possible in your garden. Another great tip for choosing a planting location is to try to keep your roses within the natural air currents in your garden. Moving air is great for a rose bush as it helps keep the leaves dry and healthy, which in turn helps prevent diseases. Planting the rose Wedgewood is not at all difficult and chances are, you probably already have the tools you need in your shed. Before you start digging however, I suggest that you take a trip to your local garden center and pick up a bag of a good organic compost. This stuff makes for a great soil amendment and you will be amazed at how quickly your roses establish themselves. When you dig your hole, mix in the compost with the loose soil at a ratio of 1 part compost for every 2 parts soil. If you have a wheel barrow, that will be extremely helpful for this step. How you plant your Wedgewood roses depends a little on how you purchased them. If you bought them from a local nursery in a container, then all the guesswork was already done for you and you just need to get them into the ground. Dig yourself a hole that is at least twice the diameter of the container, and equally as deep. Digging the hole this way will give you plenty of room around the roots of your rose Wedgewood for your new soil mix, while still keeping the bud union at its current depth. This is important! 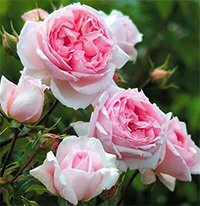 If you ordered your rose Wedgewood from an online nursery, then they may have shipped the plant to you as a bareroot plant still in dormancy. These are not tough either so don’t worry, they only look intimidating. Start by soaking your plant overnight in a bucket of lukewarm water prior to planting day to start rehydrating the roots. Then dig yourself a hole that is as wide as the longest roots on the plant, and deep enough so that you can set the plant atop a mound of soil and still keep the bud union an inch or two below the surface. Once you have your rose Wedgewood set in place, spread the roots out in all directions around the mound and then back fill the hole only halfway to start with. Take your garden hose and water the loose soil heavily until it flows around the roots like mud. Go ahead and back fill the hole the rest of the way and give it one more heavy watering, being sure to top off any final settling that may occur. This method of planting should ensure that no air pockets have formed around the roots. Taking care of the rose Wedgewood is a simple matter and you can adopt normal rose bush care guidelines. Make sure that your roses get ample water but be careful that you are not overwatering them. A good rule of thumb is to make sure that they receive one deep watering per week. You can also give your Wedgewood roses a dose of an all-purpose, granular fertilizer in early spring when the leaves begin to bud. Since this climbing rose is a repeat bloomer, it will also benefit from additional feedings throughout the growing season. I will typically give my roses a second dose just before the first big bloom, and then a third dose around the middle of the summer, to promote late season blooms. You should prune your rose Wedgewood in early spring before the leaves start to form. Begin by cutting away all the dead wood, as well as any canes that look discolored from disease. Next, start cutting back any lateral canes that overlap one another as these will eventually compete for sun light once the leaves open up. Lastly, give your rose a light pruning for shape and height if desired. This is also a great time to rake up around the base of your roses to get rid of all the debris that may have collected there from the previous season. Never let dead leaves and decaying matter lay around your roses as it can become an invitation for disease. Throw away all this material in the trash, along with your cuttings. Never throw them into the compost pile! I always finish up my pruning by giving my roses a fresh layer of mulch to start off the growing season.